...are worth their weight in gold! I've learned that it's not what I have in my life but who I have in my life. I don't have a big house, a new car or lots of money. What I do have is an amazing family, loyal friends and memories that will last forever. 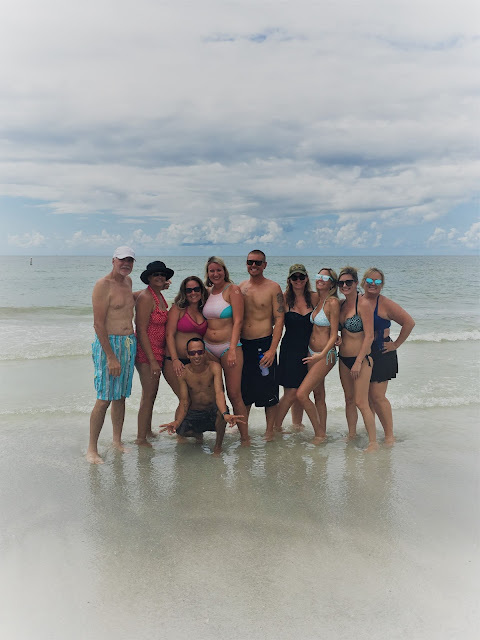 A trip to the west coast of Florida brought some of my family and friends together for a weekend of fun. We always have a great time together and we spent most of our time in Florida's sunshine at the pool, at the beach, on an island and boating. I'm fortunate enough to surround myself with good people who bring out the good in others. They have lifted me up in so many ways, keeping me positive and grateful. They inspire me to fulfill my dreams. They also know I love discussing swimwear styles and I'm happy to see them becoming quite savvy at knowing swimwear styles themselves. I enjoy helping other women feel confident and knowledgeable about the best swimsuit for their bodies. And, so much more than just bikinis. Seen above my friends and family are rockin' a one-piece, a high-neck top with ruffled bottoms, a tankini, skirts, fringe, crochet and smiles for miles! Knowing a fit and style specialist who follows all the trends can come in handy. Especially if you are looking for something in particular or maybe you just don't know what is available/right for you. My goal is to help you feel beautiful and confident. I'm even known to give swimsuits away! Please let me know if you ever need anything, want me to help you find a suit or have any questions. Love you all!